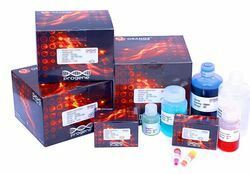 These Immunology Teaching Kits are mainly consumed in dept of Biotechnology, where Immunology is consider as a part of major subject. Precipitation Technique is One of the method in Immunology . To assess the degree of similarity of the antigens. In this test, different antigenic preparations, each containing single antigenic species are allowed to diffuse from separate wells against the antiserum. Depending on the similarity between the antigens, different geometrical pattern is produced between the antigen and antiserum wells.The pattern of lines that form can be interpreted to determine whether the antigens are Pattern of Identity, Pattern of partial Identity and Pattern of Non-Identity. Ouchterlony double diffusion (ODD) or immunodiffusion technique is one of the simplest techniques extensively used to check antisera for the presence of antibodies for a particular Ag and to determine its titer value. In ODD assays, solutions of Ag and Ab are placed in adjacent wells cut in agarose gel and are allowed to diffuse radialy. The Ag and Ab concentration are relatively higher near their respective wells. As they diffuse farther from the wells, their concentration decreases. An antigen will react with its specific antibody to form an Ag-Ab complex. At one point their concentrations become equivalent and the Ag-Ab complex precipitates to form a precipitin line. In Immuno electrophoresis, the antigen mixture is first electrophoresis to separate its constituents by charge. The antiserum containing the antibodies added into the troughs diffuses with a plane front to react with the antigens. Due to diffusion, density gradient of the antigen and antibody are obtained and at a specific antigen/antibody ratio (equivalence point) huge macromolecules are formed. They form a visible white complex which precipitates as arcs in the gel. The arc is closer to the trough at the point where the antigen is in highest concentration. The method is very specific and highly sensitive because distinct zones are formed. In this method it is important that the ratio between the quantities of antigen and antibody should be proper (antibody titer). Quantitative precipitin Assay is based on the principle of precipitation reaction between antigen-antibody interactions. Increasing amounts of antigen are added to a constant amount of antibody and the weight of precipitate formed in each tube is determined. Originally precipitin was thought to result simply from the build up of a large three dimensional lattice formed by combining site cross linking of epitopes on different antigen molecule. It is now also known to depend upon the presence of an intact Fc region in the antibody. Precipitation is far less efficient with (ab) fragments of antibody, even though they are divalent. In this procedure, appropriately diluted samples are applied to small circular wells cut into an agarose gel which has a specific antibody already incorporated in its matrix. When migrating in an electric field, the protein of interest will eventually reach a critical point of antigen-antibody concentrations resulting in the local formation large precipitating complexes. The agarose gel can then be stained and the rocket-shaped precipitate becomes apparent . The position of this peak is directly related to the concentration of the protein of interest. The antiserum to the antigen to be quantified is incorporated in agarose and gelled on the glass slide. The antigen, in increasing concentrations, is placed in wells punched in the set gel. The antigen is then electrophoresed into the antibody containing agarose.The pattern of immunoprecipitation resembles a rocket and hence the name. Single radial immunodiffusion (RID) is used extensively for the quantitative estimation of antigens. The antigen-antibody precipitation is mademore sensitive by the incorporation of antiserum in the agarose. Antigen (Ag) is then allowed to diffuse from wells cut in the gel in which the antiserum is uniformly distributed. Initially, as the antigen diffuses out of the well, its concentration is relatively high and soluble antigen-antibody adducts are formed. However, as Ag diffuses farther from the well, the Ag-Ab complex reacts with more amount of antibody resulting in a lattice that precipitates to form a precipitin ring. Immunoprecipitation is a technique that uses antibodies specific to a protein to remove those proteins from solution. The antibody-protein complexes are precipitated out of solution with the addition of an insoluble form of antibody binding proteins. Examples include Protein A, Protein G, Zysorbin, Immunoprecipitin, or the addition of a second antibody to the solution. Immuno electrophoresis is the electrophoresis of a determined antigen mixture in an agarose gel that allows the separation of different antigens along the gel slide, and then the lateral diffusion of an antibody in the gel. Counter Current Immuno electrophoresis is a modification of immune electrophoresis in which antigen and antibody move in opposite directions and form precipitates in the area between the cells where they meet in concentrations of optimal proportions. Looking for BIO TECH TEACHING KIT - Precipitation Techniques ?